It’s that time of year again—Myrtle Beach Bike Week (MBBW) is just around the corner. For more than 75 years, motorcycle enthusiasts have come roaring into Myrtle Beach and the Grand Strand for over a week of riding and vacationing in the sun. At MBBW, riders meet old friends and make new ones, tour on our miles of beautiful coastline, and party for 9 whole days. This year, the party starts on May 12th and ends on May 21st. Helmets—know the law. South Carolina law requires all riders and passengers under the age of 21 to wear an approved helmet. Adult riders should be aware, though, that if they plan on crossing the nearby North Carolina border, NC law requires helmets for all riders, no matter how old. Inspect your bike early. To avoid breakdowns or accidents that can ruin your vacation, give your bike a thorough inspection before Bike Week. Don’t forget to check your signals and lights, tire tread, air pressure, chain, oil and oil filter, and air filter. Group-ride safely. 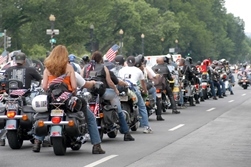 If you’ll be riding with a group of friends, remember that a motorcycle requires a full lane of space to operate safely, so don’t ride side-by-side in a lane. Either ride in a staggered formation, or single-file on narrow roads. Check your mirrors often to make sure the group is still together and that you have adequate space to maneuver in case of a hazard, and ensure that new riders are in the center of the pack, not trailing behind. By following these tips and using common sense while riding this year, we can all do our part to keep Bike Week fun for everyone. If you or someone you love is hurt in a motorcycle accident this year during Myrtle Beach Bike Week, you may have legal options to seek compensation for your medical bills and more. To talk to an experienced personal injury attorney about your legal situation after an accident, call the Law Office of Kenneth E. Berger at 843-800-0911.